A new £3m library, which includes a learning centre, a computer suite and a children's library, has opened in Bristol. The building, at Baptist Mills, has taken its name from the nearby Junction 3 of the M32 motorway. 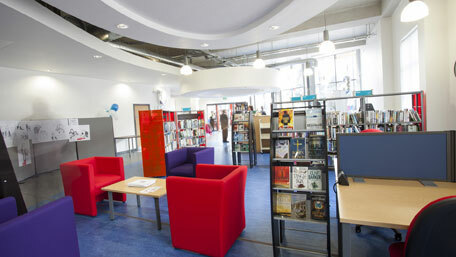 The library sits within a larger development at the site and forms part of an £8.4m partnership initiative between the city council, Knightstone Housing Association and the Big Lottery Community Libraries Programme. The wider J3 site features seven commercial and 59 residential units and there are learning and training rooms available to book, including an ICT suite and new public open space. Kate Murray, head of libraries, says: "We are expanding the services we've got, including e-books and downloadable books and are constantly trying to change to provide what people want. In Bristol we are doing really well and have almost two million people through our doors every year." BBC online regional news report. The Bristol City Council Junction 3 library home page, with more images.